[Budget re-release] One of Turrican's major assets is the massive end of level guardians, in the shape of giants fists and the like, all of which have a particular weak spot that needs to be continually shot at or frazzled by your lightning. A massive game which is packed with aliens, power ups and secret caverns, Turrican is well worth a look. Plus de 1300 écrans, une animation réussie, une vingtaine de musiques, une action soutenue... On en redemande! Turrican ist ein Spiel, das jeder kennen sollte. Es macht auf allen Systemen Spaß, obwohl die 16-Bit-Versionen für den Amiga und Atari ST meiner Ansicht nach die besten sind. Dies ist ganz einfach mit dem genialen Sound zu begründen, der in der ursprünglichen C-64-Ausgabe nur im Titelbildschirm und während der zwei Flugabschnitte vorkommt. Der kleine Brotkasten holt jedoch alles denkbare aus sich heraus und ist ebenfalls unbestreitbar ein Hit. 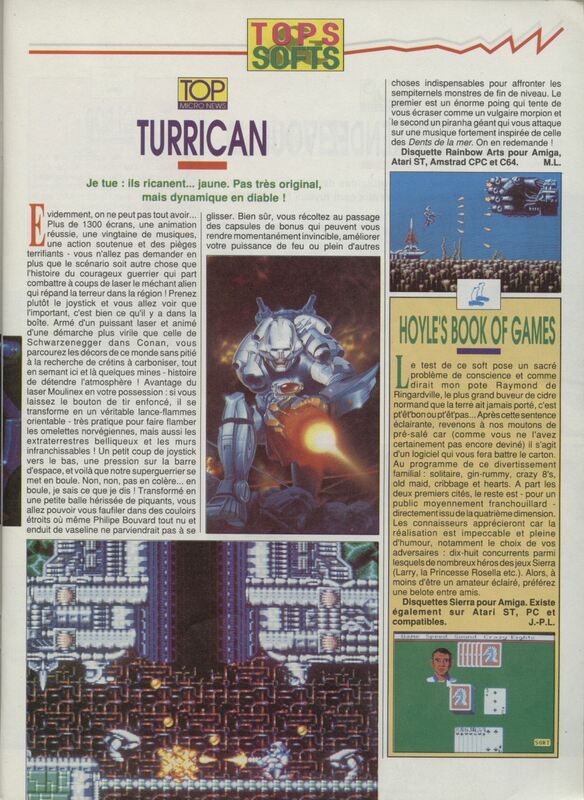 ...Turrican2 è gaudio, commozione, meraviglia, un capolavoro di adrenalina pura, un esperienza che vi segnerà per il resto dei vostri giorni, un avventura che una volta terminata, ricomincerete da capo, ancora più avidi di conoscenza e desiderosi di scovare i numerosi bonus e le stanze che Manfred vi ha tenuto nascoste. Un titolo da avere ed assaporare. The massive amount of firepower at your disposal makes this a terrifically satisfying blast, and what makes the game even better are the game's great graphics and music - the sample-packed title track is particularly impressive. Like I said, get this. The C64 Gold Medal has finally spawned the inevitable Amiga conversion, and once again the world is under threat. Unfortunately not a great improvement over the C64. Turrican being a good but far from outstanding sprite. Shading is grainy in places. Backgrounds are generally effective and scroll smoothly. Although end-of-level monsters are the stars of the show - big, threatening and nice to took at - the shading on floating mines is excellent: very realistic indeed. Energetic music and atmospheric sound effects add much to the game. The lightning bolt buzz being one of the most cinematic sounds I've heard in a computer game. Although not a particularly impressive Amiga game, it is the best pure arcade blast released for the 16- bit Commodore so far this year. Turrican gets more out of the Amiga than most of the Amiga games to date. Rainbow Arts 'know something' about the Amiga that other programmers in Europe and the US clearly don't. It is almost enough to restore faith that the Amiga is the best games machine money can buy despite rumours of things like FM Towns and Neo Geo's stealing its thunder. From a sound, graphics, and colour-use perspective it is simply head and shoulders above the rest. Programmed by the same team who brought you Denaris, Turrican looks to be a turning point in European software. Featuring lots of extra weapons, neat sprites and hidden bonuses, it's very reminiscent of the Japanese shoot 'em ups which have clogged up arcades and kiddies consoles for the past six years. Best of all though, is the choice between exploring every inch of the landscape and discovering all sorts of new features, or just blasting your way through a level as quickly as possible. A rip-roaring roller-coaster romp with impeccable aesthetics make this one of the best shoot 'em ups around. Glücklicherweise blieb das Gameplay dabei nicht auf der Strecke. TURRICAN war schon auf dem 64er ein schlichtweg geniales Spiel, das alles aus dem „angegrauten Volks-Compi“ herausholte. Auf dem Amiga wird dasselbe geboten, mit 16-Ventil-Standard versteht sich. Ich hoffe, Ihr versteht, was ich damit meine! Dat Ding ist jut. Kaufen und ASM-HIT sind anjesacht! Glückwunsch, RAINBOW ARTS! Everyone has nightmares at some time. But where do they come from? Legend tells of a creature with a highly-developed psyche, due to his three-headed mutant form. Turrican ist eine actiongeladene Ballerei in programmiertechnischer Perfektion: Die Animationen sind flüssig, die Hintergrundgrafiken gelungen. und die Sounds ausgezeichnet (jeder Level hat seine eigene Chris Hülsbeck-Musik). Hinzu kommt der ausgefeilte Schwierigkeitsgrad — wie es sich gehört. wird dem Spieler von Stage zu Stage immer ein bißchen mehr an Joystick-Geschick abverlangt. Somit ist Turrican nicht nur ein kleines Meisterwerk deutscher Programmierkunst —es macht vor allem wahnsinnig Spaß! "Sleep, those little slices of death, how I hate them." Edgar Allen Poe's vision of slumber has been proved truer than ever in Rainbow Art's massive follow-up to X-out. Hier ist ein Spiel, bei dem nach Herzenslust gesprungen, geschossen, Monster gekillt und Level erforscht werden dürfen. Hauptperson bei "Turrican" ist ein bis an die Zähne bewaffneter und zentimeterstark gepanzerter Krieger, mit dem man fünf Riesen-Welten durchsucht, von denen jede in mehrere Levels unterteilt ist. Famoses Gamedesign läßt Turrican jedoch zu einem wunderbaren Spielerlebnis werden, denn unfaire Stellen sind so gut wie nie auszumachen. Factor 5 lieferte bei der Umsetzung hervorragende Arbeit, die sie erst mit dem Nachfolger übertrafen. En historia för mycket länge sedan berättar om den trehövdade Morgul, som lever ett avskilt liv i sitt kungadöme. Denna Morgul är orsaken till all skräck och alla mardrömmar i människosläktet. Det är också sagt, att i forntiden blev han förbannad till en okänd dimension av hjälten Devolon. Skräck och sömnlösa nätter försvann ur folkets liv. Mitt pekfinger börjar få valkar. En effekt av Rainbow Arts nya megahit Turrican – ett plattformsspel som kommer att sätta en ny standard för framtida plattformsspel på Amigan. Just too big, and having the 'continue' send you right back to the start of a (huge) level doesn't help any.